The only mall on the east side of the Toledo area, the 800,000 square-foot Woodville Mall opened in 1969 as a result of a population boom in the area. 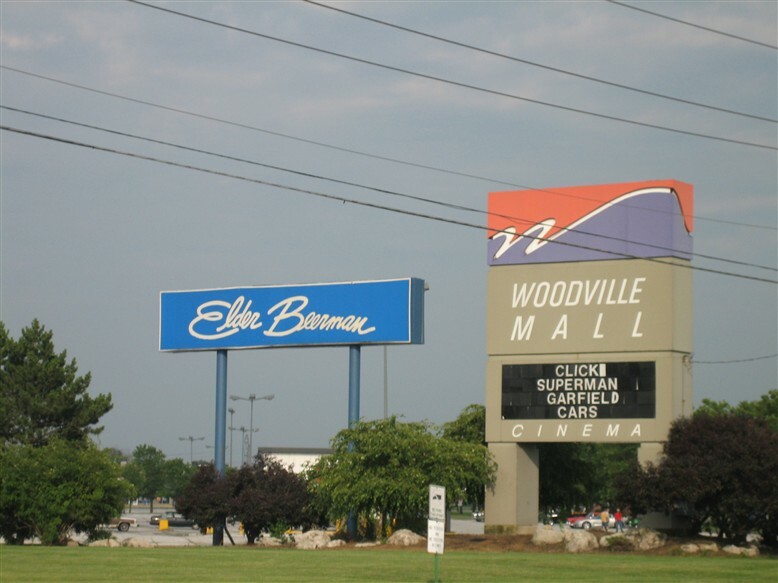 Located about a mile east of I-280 off Woodville Road in Northville, Woodville Mall is anchored by The Andersons, Elder Beerman and Sears. In addition to the anchors, there is space for about 100 stores; however, presently less than 20 stores are open for business. What went wrong? Just as with Southwyck Mall across town, Woodville fell victim to poor management, changing demographics, and competition. The main retail area in the Toledo area is currently clustered across town surrounding Franklin Park Mall on the northwest side. In addition, two outdoor centers with retail space totalling over 1.5 million square-feet are emerging in southwest suburban Perrysburg and Maumee. The area surrounding Woodville mall is holding its own, but is not currently experiencing major growth. Many of the retail areas surrounding the mall are over 20 years old and are not aging gracefully. This includes Woodville Mall itself. Considering Woodville’s last renovation was in 1987 by then-owner and mall giant Simon Property Group, the mall is almost 20 years out of date and it shows. The floor throughout the mall consists of relatively well-kept yet out of date tiles in the center of each relatively wide hallway. However, along the edges of each hallway on either side of the tile is a horrendously tattered, faded dark green carpet. In many areas, the carpet is worn completely bare or ripped. This can’t be enticing shoppers, and is probably indicative of the current owners lack of commitment to keep the enclosed mall viable. Other design features of the mall including dead storefronts of wildly varying conditions (including a very old wooden facade with a Orange Julius labelscar!) and sparsely decorated interior spaces. There are a few planters and palm trees, but much of the open area of the mall feels too empty and almost deserted, especially with the lack of kiosks that most malls seem to have in spades these days. 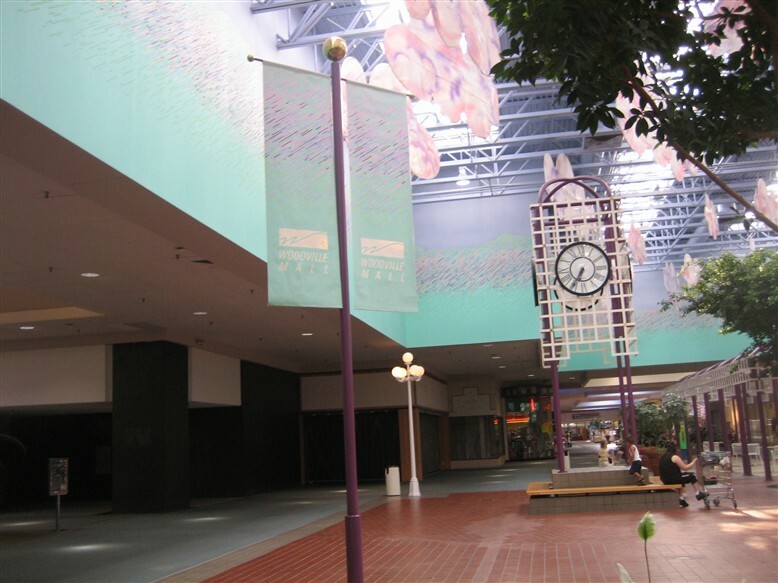 Toward the west end of the mall, the Food Court is also interesting with its bright 80s decor, yet it too is sadly mostly empty these days. In many ways the condition of Woodville could be considered comparable with that of Southwyck; however, Woodville has retained all 3 of its anchors while space in the mall has suffered, and somewhat of the opposite is true for Southwyck. The absolute best design feature of Woodville Mall is its center court. The walls surrounding the warehouse-style high ceilings have been painted in shades of periwinkle and light blue with a stippling technique to mimic the sky. Furthering the sky illusion, several large “clouds” hang from the ceiling suspended in mid air. Back on the ground, there are all these rows of inappropriate-looking, tall, purple bars with white latticework on top. I have no idea what they are. There is also an elevated gazebo made with the same purple bars and it has a white latticework roof. At least I could figure out what that was. In addition to all that, there are all these random white tables and chairs strewn about on the ground that don’t seem to be used, but I suppose it’s better than having nothing there at all. As with many enclosed malls which have rapidly gone downhill, it wasn’t this bad until recently. In September 2005, Simon Property Group of Indianapolis sold the failing mall to two California businessmen, Jack Kashani and Sammy Kahen for $2.5 million. 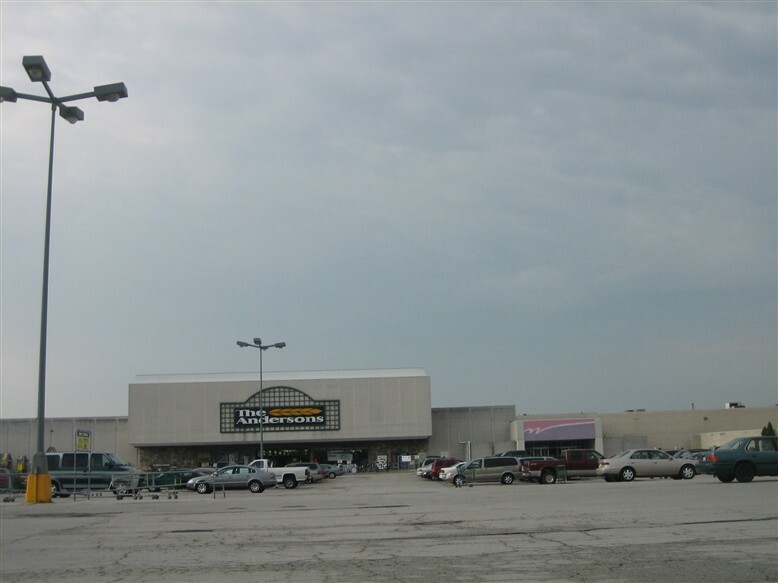 The pair also purchased the beleagured, large North Towne Square/Lakeside Center on Toledo’s north side, which was, if you can even imagine, the worst of them all in terms of occupancy with only a few stores open. Not surprisingly, they shuttered that mall in February 2005. So, what’s next for Woodville Mall? In October 2005, the Toledo Blade reported the new owners hired Krone Group LLC, a retail consultant from Cleveland, to hammer out plans for revitalization. The plans initially included some lofty goals, and a long-range plan to retenant the existing mall while bringing in additional new office space, an indoor ice rink, a new movie theatre, residential units, and even constructing new access roads to the north. Not surprisingly, none of this materialized, and in June 2006 the owners released a more vague, scaled-back plan to the Northwood town council. They said they were studying several options, but most likely would be tearing down the nearly empty mall except for the three anchor spaces which remain economically viable. As of November 2006, several months have gone by with more stagnant inaction on the project, leaving us to wonder what – if anything – will actually take place on the site. When the annoucement was made that the owners were likely razing the mall, many locals expressed their opposition. Most of the people interviewed by both the Toledo Blade and on the blog Toledotalk.com preferred the enclosed mall to an outdoor development, especially considering 2 outdoor centers are emerging in Maumee and Perrysburg as well as the eventual redevelopment of Southwyck. Holy Toledo, what a mess. I took all the pictures featured here in July 2006. As usual, comments are appreciated. Haven’t been to Woodville in years, but the pictures bring back some memories – always seemed dark inside, due to the carpets and the wood paneling on several stores. The Andersons was once a Macy’s, while the large space in the middle picture in the third row was Woolworth’s. Always thought it was strange that there was a tire store right in the mall. @jamie, Wood County officials closed down the mall after a judge signed an emergency court order (on Dec. 16, 2011) due to massive holes in the ceiling, leaking water, huge areas of mold and mildew, no functioning fire sprinklers, etc. The inside temperature was 38 since the heat has been cut off for more than a year for non-payment of the bill and there was concern the weight of the predicted snow would collapse the already weakened roof or the pipes would freeze and burst. @jamie, The Anderson’s was J. C. Penney & Co. The north side of the mall was home to Lasalle’s. In the early 80’s it was renamed to Macy’s. A few years later, the former Lasalle’s stores were sold to Elder Beerman, of Dayton, and rebranded accordingly. 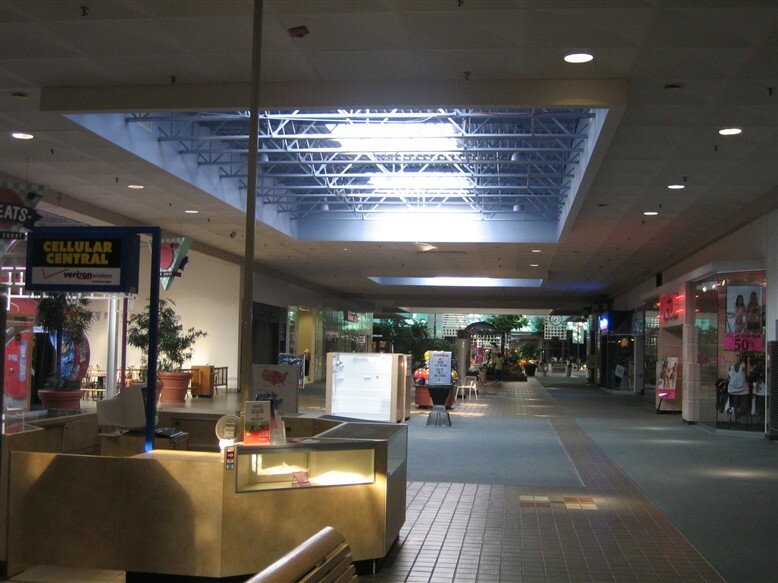 The architectural elements of the mall–the exposed steel trusses in some areas of the ceiling, the carpeted floors, airy atmosphere, even the parking lot lights seem reminiscent of Century III Mall in West Mifflin, PA (near Pittsburgh), which has also seen better days. I’d like to see a blog on that mall in the near future, as it’s a very interesting place. Gary–I’d agree, and actually Century III is a favorite of both of ours. Unfortunately, I don’t have photos (I wasn’t yet taking them when I visited about 2 1/2 years ago) but Prangeway might. Pittsburgh is a great mall town in general. @Caldor, I do agree. At least the redevelopment plans for Century III don’t include razing the building but do call for a $13 million dollar renovation. One of the plans for the renovation includes a new multiplex cinema (if that’s ever gonna happen. I hope it does!) some new big box stores in it; rumor has it that Bloomingdale’s might move into the old Sears store. If so than it will be the only other Bloomingdale’s in the whole state of Pennsylvania, the other being at King Of Prussia (which is the largest mall in the state; as well as on the east coast). Another plan for the renovation is new and better lighting, new carpeting, new flooring, maybe a new paint scheme in it, and an improved parking lot. I do hope they keep the handrails though because they scream of the 70’s and 80’s! So who knows. Yeah, that’s true. Pittsburgh in my opinion is overmalled. You have Ross Park, Northway and Clearview to the north; Monroeville, Westmoreland and Pittsburgh Mills to the east, South Hills, Century III, Uniontown, Laurel, Washington and Washington Crown Center to the south, and Robinson and Beaver Valley to the west. 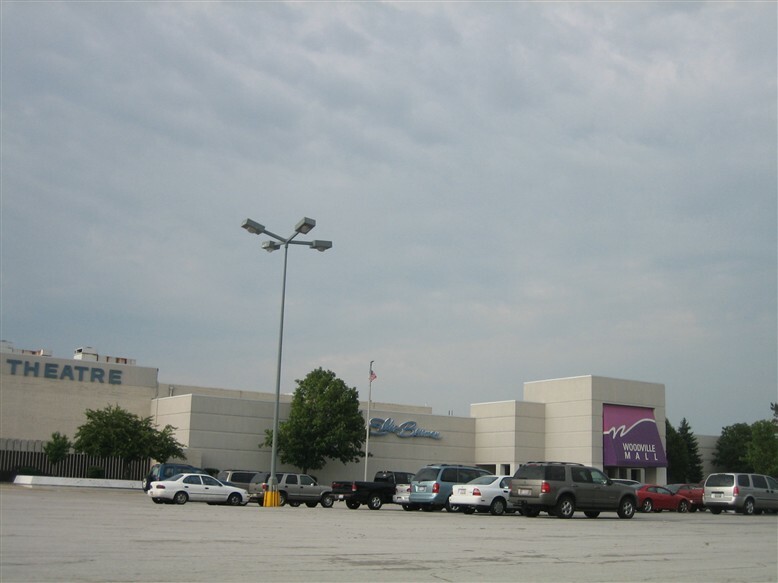 Greengate and Eastland Malls were once top tier malls in the area but have closed in recent years due to competition from nearby malls and shopping centers. @Gary, do forget about the old East Hills/Penn Hills mall and I’m not talking about the East Hills mall with the “terrible mall commercial”; I’m talking about what was possibly the first mall in Pittsburgh which opened up in 1960 but was an open-air type of mall or shopping center. That mall has been gone for years! Now what’s in it’s place is a small forest with a parking lot around it. A strange mall; half carpet-half tile, walls from other eras, and strange egg-looking cardboard clouds. It seems this mall has it all and an appearent identity crisis from the 70s to the 90s. That Eller-Beerman looks a lot like Sage-Allen’s lastest logo before they went under in the early ’90s. The center court does look very distinct; a fine way to accentuate natural light. Too bad the rest of the mall can’t save itself. This mall looks like Eastview Mall in suburban Rochester before the mall was remodelled in the mid-90’s. Freaky retro trip. How Eighties! You know, most of the architectural features are in place. A minor remodel is all this place would need to look better. But, it sounds like it’s on the downhill. I’ve never heard of the anchors, before, either. Oh, and gotta love the Goodyear tire store! The Andersons’ was never a Macy’s. Macy’s used to be located where Elder Beerman is presently. The Anderson’s store used to be a J.C. Penny store. This is about the stores in the Woodville Mall in 1969, wasn’t Macy’s called LaSalle’s before it became Macy’s and then Elder Beerman’s? 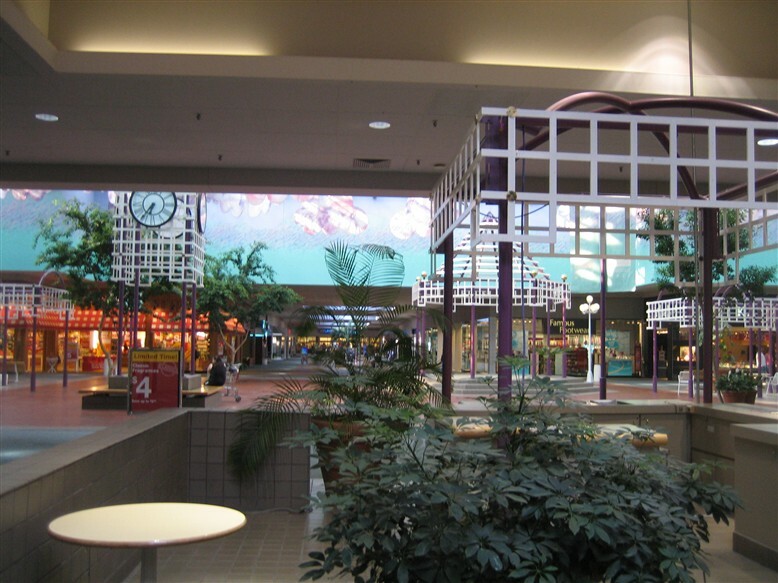 (When Woodville Mall opened) In the center of this mall was a fountain that shot up into the center space at three heights, and had multi-colored lights playing up into it. Sadly, it died and was replaced later with a much simpler one. Just wasn’t the same. This question is for the mall walkers. How many times around the interior of the mall, including recesses to walk a mile? 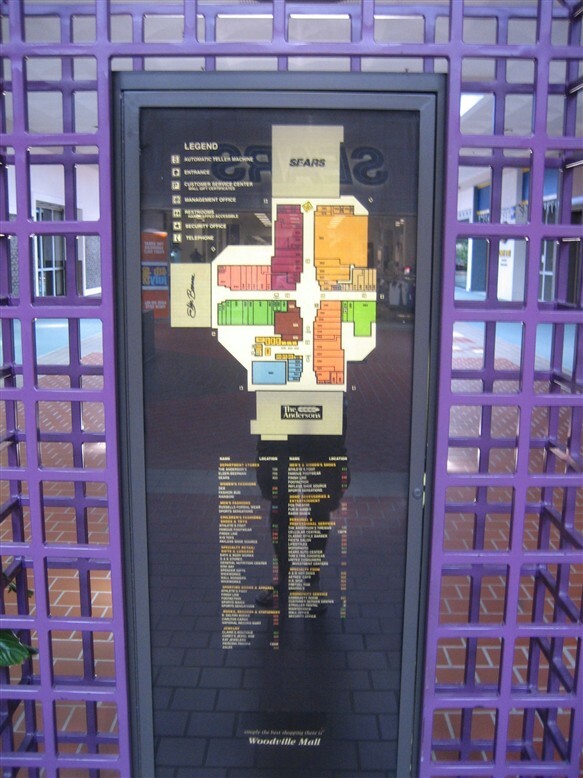 One time around the mall…including the recesses is exactly one mile. That’s why Woodville Mall always had the most mall walkers because of the exact measurement. Macy’s bought the locally-based LaSalle’s chain in the late 1920s and kept the LasSalle’s name until 1981, when all of Macy’s non-Macy store brands (e.g., LaSalle’s, Davison’s in Atlanta) were rebranded and the merchandising went from the bargain basement-oriented style of May stores to something more upscale. The prototype was the Macy’s in New York, which successfully went from being a haven for bargain hunters to something like a cheaper version of Bloomingdale’s. The concept didn’t work in Toledo, where LaSalle’s had been the dominant local chain, with the old format. LaSalle’s management was first consolidated with Macy’s-Kansasa City, then both were consolidated with Atlanta. The Lion Store (part of Mercantile, now Dillard’s), a cheaper, less comprehensive store was able to take the Macy/LaSalle niche in Toledo. In the mid-80s, Macy sold the stores to Elder-Beerman. They also sold the Kansas City stores (either directly to May or to someone else who eventually sold them to May). Woodville has been in decline for years. The location is a poor one. It’s on an interstate that mostly gets truck traffic going between the Ohio Turnpike and points East to points in Michigan. It’s on the historically blue collar side of Toledo, which has had little growth since the 60s. 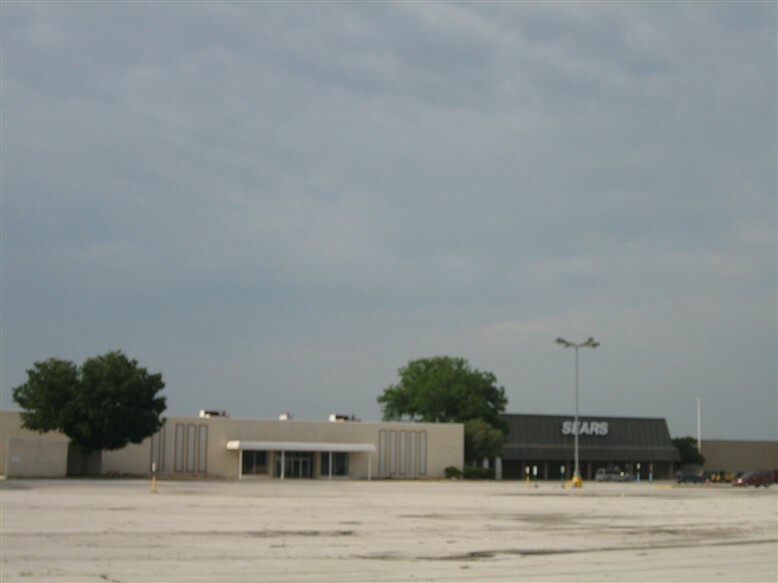 Although the mall was close to solid satellite markets like Bowling Green, it needed to be reached by back roads. Southwyck took away some of its volume, and by the early 80s, the combo of North Towne (then new) and Toldeo’s industrial decline made it a fairly ghostly place, with surprisingly weak traffic during the Christmas season. It also was overrun by shoe stores–in the days when there were more shoe chains, the proportion of mall stores given over to shoe stores was a good indicator of a weak mall. Toledo has only one other Sears (at Westgate, near the dominant Franklin Park Mall). I think the only other Elder-Beerman left also is at Westgate. That makes Woodville a good place for the anchor’s. The Andersons is a good store for drawing rural folks, as well as suburban (it’s a cross between Trader Joe’s, a farm equipment store, and place with work clothes and western wear–the fad for Carhartt work clothes is a boon for them). The Mall would work better as a power center—-it could never get “lifestyle center” type stores. Those gravitate toward Franklin Park or the new Levis Square development in Perrysburg. F.Y.I. The clouds in center court are for sound absorbency during events to avoid echos from microphones, etc. Yes, Anderson’s used to be JC Penny. The mall has nothing to do with Elder Beerman, it is a complete seperate entity, just in the same building. The mall was purchased by the California men in September of 2004, not 2005. Positive redevelopment plans are scheduled for Fall of 2007. Visuals can be obtained through the krone group, llc’s website. Oregon and Northwood cities have done a great deal of market research for this area in the past six months and the area seems very promising. Directlly across from the mall, Steve and Barry’s just opened. In Oregon, rezoning is being done for four box retailers on the corner of Navarre and Laulendorf. This is a very promising area for new development. Give it five years. @Stephanie, Oh yeah… is it now one of those “lifestyles”? Or is it another enclosed mall? I have been saying for years that they should turn Woodville Mall into an outlet mall. That is the customer you need to target on that side of town! Trust me, I grew up there! 🙂 Toss in a Best Buy, or a Target somewhere nearby, and you could not keep my mother away for anything! I would miss it if it left. Every time I walk in there I reminisce…smells the same as it did twenty years ago. Lot of memories here, growing up on the East side of Toledo. There was a giant play area for kids that I think was modeled like a pirate ship somewhere near the center. All my friends swear it didn’t exist, but I distinctly remember playing in it when I was younger. I was surprised to see the plans for the space that Stephanie mentioned (http://www.thekronegroup.com/krone_group/docs/Woodville.pdf). They look great, but who knows if they will ever materialize or, sadly enough, sustain themselves if they ever do happen. Was the Andersons/JCPenney originally Woolco? Sure looks like it. Yes it was, I remember when Woofworth’s was there. WoolCO, not WoolWORTH; Woolco was the discount division (think Kmart or Wal-Mart type store). We already established that Woolworth is vacant. The Anderson’s was a JC Penney that was original to the mall. If there was a Woolco, it would have been on an outparcel. Malls of that era in a city the size of Toledo would not have had discount store anchors.Woodville was the 1st enclosed mall in Toledo, it was a big deal when it opened. It was originally a DeBartolo mall. Hey! I was just searching trying to find the hours for the Woodville mall and instead I found this. I’m 20 years old and from the Millbury, Ohio, area, which is farther East of this mall and so this, sadly, is the closest shopping centre type place around. Perrysburg and the Commons is next closest but still, who wants to drive 25 minutes when they are in a hurry to pick up something from a more specialized store? It is sad the state of the mall, because I do remember it from the late 80’s onward. I remember when Woolworth’s went out and then it sat vacant for years. The last thing I remember it being was a skate park. I do recall that in my early high school years the mall made a slight comeback with teenagers interested in things like the music scene because of the skate park and Rick’s coffee house (both of which are now gone). I was in this mall just the other day to pick up something from Deb’s a store with cheap clothing and now I need to run and find some cheap jewelry for a Halloween costume and figured Claires was the best bet. It really is sad that this mall has reached such a point. I spoke to a friend of mine who was just there about a week ago for the Elder Bearmans HUGE sale, the one where they open the store 2 hours early. She said she was the only person in the store, she couldn’t even find anyone working there. Ouch! The “Deadville” mall as it is fondly called by the younger generations of this area has always been a topic starter when there’s nothing else to talk about. Everyone wonders what will really happen to it. Ah, this does bring back memories. Even when I venture into the mall some 3 or 4 times a year now it’s just to run in and then to run out. Thank you for this trip down memory lane. @Former Marketing Director, I worked there as my first real job when I was 16-17. (Circa 1983/84). Good times! Wow, this has been a real walk down memory lane to read this. Glad I stumbled across this and wish I had found it sooner!! I can clear up a lot of the guesses here about what was where over the years. I spent a lot and I do mean A LOT of time at this mall growing up. My mother worked there, first for LaSalle’s, stayed on for Macy’s and also for the eventual transition to Elder Beerman. She was there from about 1977 to the mid-90’s. I have many fond memories of spending time there with my grandparents and my friends, espcially in junior high. Sears is an original anchor store. The Anderson’s opened in the late 1980’s in place of JcPenney which had closed a year earlier as part of the renovation project. The food court is in the same corridor as the mall entrance to Anderson so this was one of the most major parts of the 1987 renovation. The food court was a great idea but never reached full occupancy. In the back near the restrooms were these bleachers with a TV area that never seemed to attract more than a few people. I sure a lot of Sbarro Pizza though! The front area of the food court near the corridor once had a restaurant tenant original to the renovation that served beer and subdivided off part of it–this had something to do with the now seemingly puzzling layout. In the late 1970’s this mall was wonderful….it had great places to grab a snack or a meal long before the food court: Hot Sam for a hot pretzel, Karmelkorn for the BEST freshly made caramel corn, the Strauss Bakery for great donuts, cakes, pies, Fanny Farmer chocolates, of course–the Woolworth coffee shop and one of my favorites, the Harvest House Cafeteria…Nothing said 1970’s like this place. The dim lighting with all of the burgundy vinyl booths, burgundy carpet, and the soothing sounds of Muzak while you enjoy your meatloaf, mashed potatoes, and jello. Yes there were lots of shoe stores probably 10 or more at one point, along with several jewelry stores, including the Schubach where I purchased my wife’s engagement ring about 13 years ago. I hope someone can bring this place back to life….I live about 290 miles from it now so I havent been there much even when I do go back home to visit. Anyone else with some of these old memories, please share! Wow, Kevin…what you wrote alone was a walk down memory lane for me…I grew up in this mall too. My first puppy was bought in the pet shop next to the theater. My first junior high kiss was in the photo booth in the arcade across from the theater. I remember buying my first 45 record in the NRM. My grandparents took my sister and I every weekend to Woolworth’s to get a small toy and then we had brunch in the Harvest House Cafeteria. The KB Toys was the best toy store around before Toys-R-Us moved into the Toledo area and killed off the small toy stores. I was lucky enough to be able to take my son there when he was two for what I believe was the last boat show. It was the first time in probably 15 years that I had been in the mall. I had gone to sears and the Andersons, but I hadn’t walked through the mall. It was so sad walking around and seeing my childhood stores and memories in such sad deterioration. Oh, I have so many great memories of this place. It is so sad to see it in its current state. I do, however, still swing back around that way for a cheap movie every now and again. The small theatre with the ever sticky floor and terrible carpeted walls has a fond place in my heart. I remember when I was younger and my mom would give me and my little sister money and let us have reign of the place to go and purchase Christmas presents for our family. That was always a great time. As a kid – this is where Santa Clause lived at Christmas time. There were no ifs ands or buts about it. This was where I ALWAYS went and had a picture taken. When I was that age he was set up in that little Gazebo thing from the 80’s. I remember when Woolworth’s went out and buying all sorts or weird stuff from their liquidation sale. My husband had a relative who worked there and if you go to his parents house you can still find boxes of the cups and napkins from the Woolworth restaurant that they ended up with in the end. It sure is a trip down memory lane! I have so many memories in this mall.I grew up in Millbury and remember Woolworths and the resturaunt eating lunch thier with my mom.The pet store and Orange Julius too.They also used to have a corndog place.In high school I remember shopping in Merry Go Round for the cutest clothes.I wish all those stores were still there.I met my first boyfriend there and had my first kiss in the front of that mall.I loved the Card stores and Spencers.Remember Woolworths so well they even had hamsters and birds.I love this mall.I hope they find a way to recreate this beautiful place. @shannon, It was the Corndog Factory. LOVED that place!! Boy did you all bring back memories! I grew up in Fostoria on US 23, so we did most of our Christmas shopping at Woodville Mall and Southwyck Mall, which both seem to be fledgling at best. Relocating to Hilton Head Island, South Carolina in the late 80’s, our only indoor mall is now in the” going under” phase too. I was just talking to all my Ohio friends, who now live in SC, about Orange Julius, Spencer’s Gifts, Hickory Farms and the cafeteria! I had more meatloaf, mashed pototaos and jello than any girl needed! Does anyone remember the Christmas train that you could ride oni in the early 70’s? I remember asking my mom what hippies were, in the early 70’s and shopping at “Merry Go Round” for a cool denim miniskirt outfit to wear to my first Motley Crue concert in the mid 80’s. Having moved away, I did not realize until finding these posts that malls were dying all over America. Now, I feel like I better hurry up and take my children to Ohio to see what I did as a child before it is gone forever! Old Towne in Southwyck Mall was the best place for kids in the early 70’s. I was telling our mall manager about it just the other dayand suggesting an area like it to rejuvinate our mall in Hilton Head. Old fashioned fun and games is seriously lacking in todays society. We at least need a Dave & Busters or Max & Erma’s to liven things up! 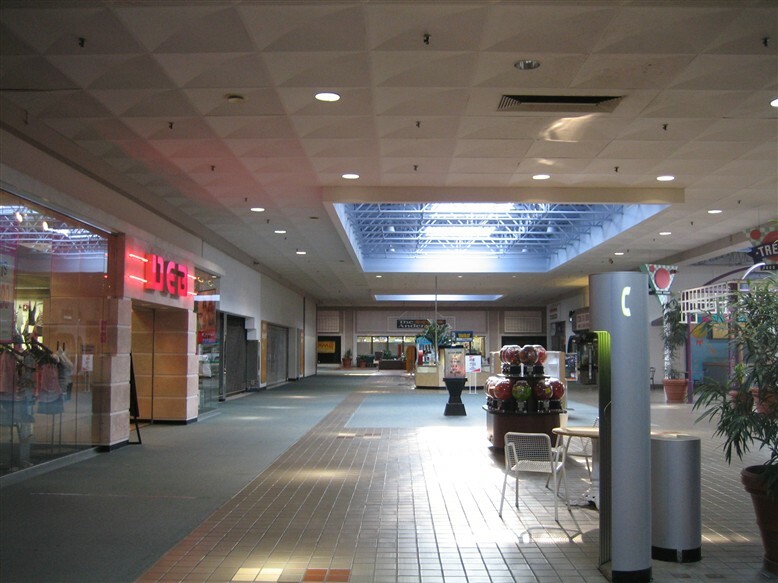 I recently heard some talk of the Woodville Mall being sold to Missouri businessmen. Any truth to that rumor, Hopefully!!!! a sports card/collectible store that has tanning booths. It seems like quite a few stores, but if you walk each “wing” of the mall it is esentially empty. I could not help but cry; I can remember in the mid-1980s when this was THE place to be on a Friday night for a 15 year old. Now, if you’re there on a Friday night and you’re 15, you are probably trying to find your first baby’s daddy and pregnant with baby number three. Good news to those of you who remember Woodville Mall as THE place to be..the mall is going to be sold to a shopping center ownership group from Minnesota. The plan is to keep the mall in tact and bring the mall back to it’s lost glory. This mall is well located and will draw customers from large geographic areas, who choose not to drive into the Westfield/Franklin Park maze of traffic and congestion. Keep watching…things will be happening at Woodville very soon. any more “good” news to be told of the revamping of Woodville Mall? I HEARD FROM AN EXCELLENT SOURCE (EDLER BEERMAN MANAGER) THAT THE MALL WAS PURCHASED!! YEAAH! THEY ARE VERY EXCITED TO START RENOVATIONS AS THIS MALL HAVING 3 GREAT ANCHOR STORES WILL BE AN EASIER MALL TO ESTABLISH OUTSOURCED STORES!! THE SOURCE THAT GAVE ME THIS INFORMATION WAS AS TRUTHFUL AS THEY DAY SHE WAS BORN SO I BELIEVE HER 100%. THE NEW BUYERS EXPECT TO START IMPROVING THE SUMMER OF 09 IF NOT SOONER. I WORKED IN THE MALL FOR 3 YEARS AND WAS SADDENED BY ITS RAPID DECLINE AND VERY PLEASED TO SEE AN INVESTOR REALIZE THAT THERE IS A LOT OF ROOM FOR A FANTASTIC MALL IN THIS AREA! PERSONALLY I DREAD GOING TO FRANKLIN PARK. SO EXPECT GREAT THINGS IN THE NEAR FUTURE FOR OUR BELOVED NORTHWOOD ICON! I certainly hope this is all true…..cannot wait to see what happens come summer, 2009. I hate travelling to Westfield Shopping end of town. Snobby people and crazy drivers!!! 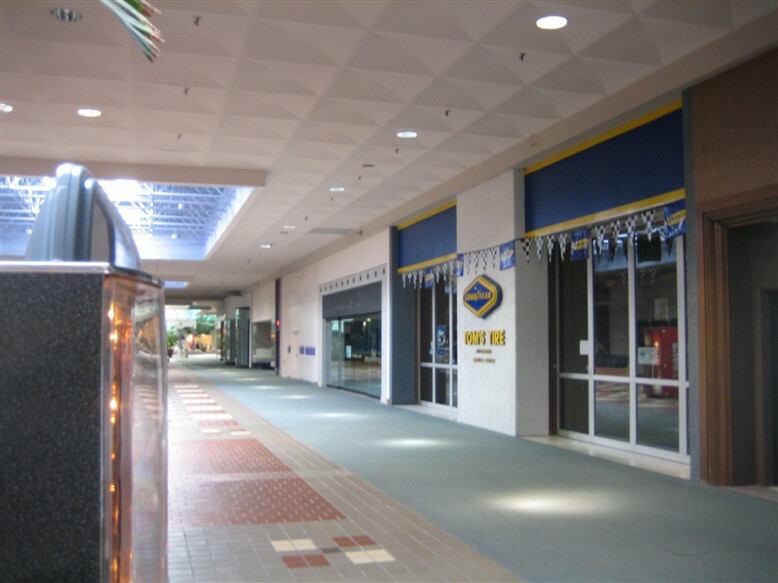 Woodville Mall was a thriving Mall when it first opened. It was one of its kind with all the stores being inside. Through the years it could still have been very good as it attracted people from Norwalk, Sandusky & surrounding areas.Among one of the things that was it’s downfall was the rent, which all the stores, especially small ones like Hallmark complained about. My son worked at Richman Bros.. & i had once asked his District manager why the Woodville store did not have as much merchandise as the other Richmans. He told it was based on volume, which they didn’t have. I’ve always felt that if they did have the better clothes, their volume would have been a lot better. The same with Macy’s. Their clerks always told me that the buyers only bought 3-4 expensive things, as they thought at that time the East Side couldn’t afford such things. But they also said that the East Siders always paid cash & the expensive things went first. I blame the original owners for Woodville’s sad shape as they didn’t put good smaller stores in, & too many shoe stores & not really revamping Woodville & getting other nice quality stores in. They left if sit & decay. People on this side of the river really enjoyed it as we didn’t like driving all the way to Franklin Park Also, you never heard of any ruckus going on like you did with Franklin Park & Southwyck. I truly do hope some decent company buys it & restores it to its granduer. Besides, it’s nice to shop inside in winter. 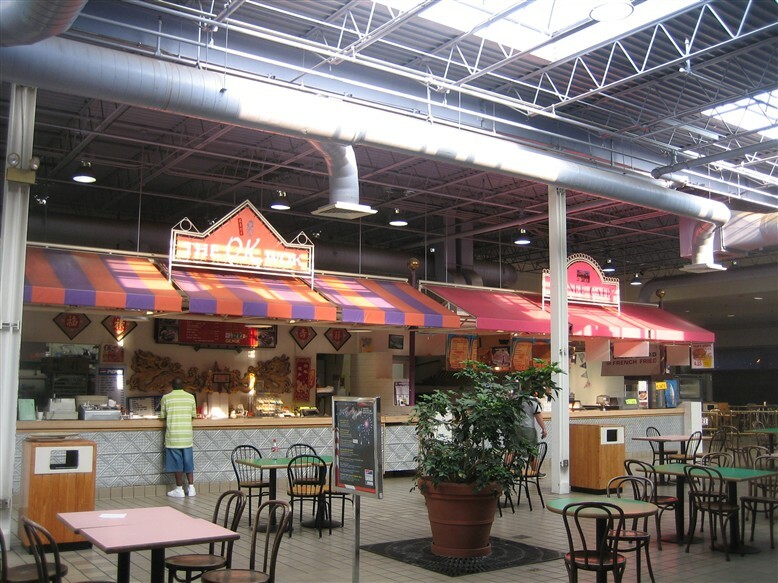 I just wanted to know if anyone remembers a Cusano’s Pizza being in the mall. I’m from Sandusky and my friends and I went to the Woodville mall on Friday nights to eat at Cusano’s Pizza. The last time I remember going was in October 1983, so it’s been a long long time since I was there. I don’t even know why we stopped going, because it was so cool, and very crowded. I always stopped by Macy’s and got something. Now the only mall I visit is the Sandusky mall. So far our mall is almost full. I hope Woodville comes back to life, I just might go back again. 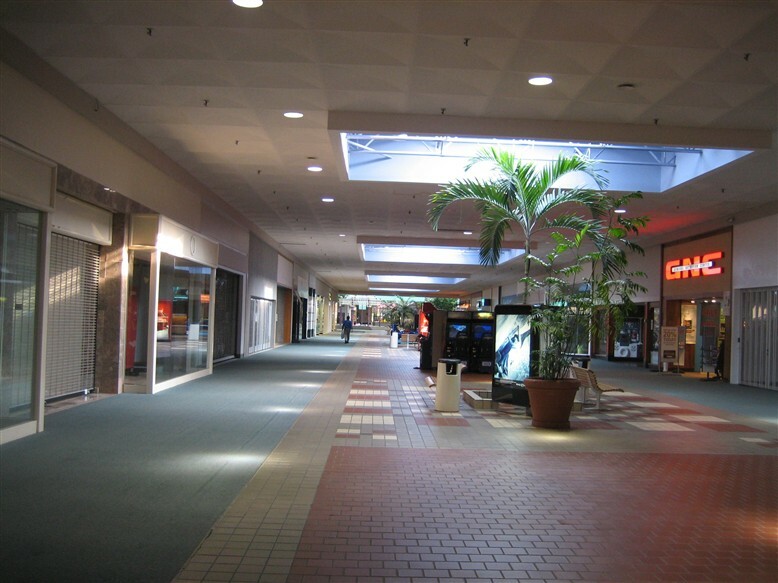 this mall is a dumb……..
sadly, everything is closing b/c nobody can really keep a store open that long anymore. hope it all comes back soon………. Does anyone know who else uses the same cake recipe that Strauss Bakery used? I loved their cakes and I can not find anyone who can come close to their cakes. Pretty cool site especcially since you can leave comments.I lived in Northwood from 1980-2001(except for parts of 1989 and 1995).So I seen its glory years and the downfall!I seen someone above say that the 70’s were the last great times and I could’nt disagree more!In the 80’s(mainly 85-until 91)this place was jumping and it was ground zero for some of the greatest times in my teenage life!This is where everyone who was a Teen or early 20’s where at on Fri.and Sat. nights!The game room was always the first place you headed or at least me and my group and NRM(National record mart)to get music.They had a pizza place 2-3 doors down from the game room up until about 87(Pizza King? )..The Original cookie was in the entrance corridor and I used to get these awesome peanut butter cup cookies at the end of the night they had everything half off.They had a pet store also in the corridor.Then of course the old Fox theater where I seen countless movies on Wed. cause they had $1 movie night(Police Academy movies,Nightmare on Elm St. movies,Friday the 13th,One Crazy summer just to name a few).After I got to a certain age and wanted to start dressing nicer you could always go to Chess King,County Seat or my favorite Merry Go Round).The person above who mentioned Strauss bakery,I remember that place in my pre-teens cause my Dad loved that place and I am guessing it went out around 85-86.I had a good buddy who loved Chick Fil-A which was in the West corridor along with another favorite Orange Julius.They always did have way to many casual shoe stores cause for a while the only athletic shoe place was the Athletes Foot in the Elder Beerman corridor.Another little bit of forgotten memory to most is this mall used to actually have a grocery store!In the Anderson’s corridor there was a Kash-n-Karry and that went out very early like maybe 83-84.I would say 2 things helped make the mall even better where the Food Court and then shortly after the The Andersons in 88.Up until the Andersons came in there was’nt many places to grab a pop and a bag of chips and other goodies.I remember alot of times after meeting in the center court of the mall or maybe before we would all head down to Andersons to get our drinks and stuff.Center court was always “jumping” and there were plenty of young people everywhere and of course girls! !The mall was the place I met alot of girls and ended up meeting the girl of my dreams in the food court named Julie Myers who I fell for hard and unfortunately didn’t have the storybook ending!I guess thats a whole other story,sorry!There was always something going on back then(fights,etc. )unlike today!Not that fights are good but that was then. I stopped going to the mall to hang out around 1993 and pretty much only went there to buy stuff.I think if memory serves me right the Mall started its downward spiral in the late 90’s but must havn’t gotten really bad till after I left Northwood in 2001.When I went back for the first time,it nearly made me cry!This was a great mall and shame on the owners who have owned it since 2000! !I always heard from everyone that they gouge businesses for the rent!No surprise its GREED! !I hope the Woodville mall is never razed and I hope it finds its way back and also the Great Eastern! I was in this mall one month ago. It is in the same poor condition now as it was the last time I was in there 2 years prior. I’m not sure what exactly is keeping it open. There is one tennant left in the food court (a chinese place, I think). There are three anchors, and approx 5-10 other tennants. Otherwise, it is a virtual ghost town. Long, empty corridors with no people around create an imminent danger for vulnerable people. Try not to go alone. Structural and property wear and tear are evident (water damaged ceilings, grass growing in the parking lot. This mall suffered a very rapid decline in the last ten years. It is sad to see places like this succumb to people’s shopping habits shifting to the likes of Meijer and Wal-Mart. The shopping mall is the original “one-stop shop” that doubles as a hang out. How many kids do you see hanging out with friends at Wal-Mart on a Friday night? Ohio retail history enthusiasts, ponder this one: Woodville Mall was Toledo’s first indoor mall, having opened in 1969. Why did little old Lima, 75 miles down Interstate 75 from Toledo, get two indoor malls in 1965, 4 years prior to the opening of Toledo’s first mall? Any ideas? As a boy in Lima in the late 1960s, I remember proudly going with my visiting grandparents (mall-less Toledo residents) to the Lima Mall. And I remember how they marveled at the Mall, with its fountains and tropical plantings (all now long gone and replaced with retail kiosks) and climate-controlled environment. Keep in mind that my grandparents were born in the 1890s, so the freshly-minted Mall was indeed impressive at the time. That no doubt touches on one reason why malls in general have declined in popularity: they’ve lost their abiltiy to awe as consumers have become more sophisticated. A day at the mall ain’t what it used to be. I think malls of this day and age would survive if they were completely reinvented in the way they awe visitors. Malls should be looked upon as destination centers rather than just your run of the mill shopping center. Instead of simply throwing in a small number of entertainment attractions in a large mall, I think they should do just the opposite, make the mall into an entertainment center and then strategically place shops in certain areas instead of having them lined in a row like a traditional mall. Most towns nowadays have sufficient retail offerings, but not enough entertainment and leisure. I do think Gary has a good point, based on my observation of shopping malls in the highly competitive Chicago retail area, where I have lived for the last decade. The malls that are thriving (and that’s not many, even in Chicagoland) seem to have retained or developed some special feature or features that , if they do not exactly “awe” consumers, they do lure them in. Is there any update on what we heard back in the Fall about renovations? This new company claimed it was going to start this summer….well where are they? They’re a little late, now that Elder-Beerman just announced they’re closing. People need to realize that this mall has some VERY NICE store fronts! They have marble flooring and entryways, nice windows and shadow boxes. If the owners had any sense of what they were doing, they would be able to get good stores in there! Everyone on the East side, as well as the rural communities would go BACK to Woodville Mall, like they used to. I’m from 15 miles east of the mall and I rarely go to Franklin Park because it’s such a long drive, so much traffic, and just not the same. These stores need to realize that everyone on this side of the river would give them business at the Woodville Mall rather than Franklin Park. The old Steve and Barry’s would be a great location for a Target or Kohl’s. Wake up and Get Busy! I am a bit older now but reading all of these really brought back many many memories. Like my first kiss I met my future wife, many $1 movies, just hanging out with friends, I loved those days and I sure hope one day to relive them their and let my kids see a piece of my past not this high dollar snobby high traffic fast moving so called malls they have now, well I think if we all come together and bring it back we could I will do my part will you? Go back by early next year (hopefully sooner) you will see a new place added, I to have fond memories of woolworth and that pizza parlor that served my favorite square pizza or the carnival store that attracted kids of all ages, I do not know what will happen in the future but I am sick and tired of trying to remember and what if so if you love this place lets bring it back the only way for things to get better is if we all try, see ya soon when you here about it come by to see us. The mall’s mortgage is being sold at public auction. The building is right around 800,000 SF. The note will sell for under $750,000. That equates to under $1/sqft. These reviews are heartbreaking. Expect the mall to be demolished in the next few months. I could be wrong and a large developer could pick up the note and give the place the facelift it needs, but dont hold your breath. I checked out Woodville Mall on September 5, which turned out to be Elder Beerman’s last day. Only a handful of stores remaining; Deb, GNC, Sports Maniac, a perfume and gifts shop, a nail salon, a couple financial/tax places, and a couple part time/independent places (one that had a sign at the entrance that said “If you have an appointment, come in and announce yourself”). I think that’s all. Oh, and the theater, Sears and Anderson’s. A musty smell permeates the place now. As was mentioned earlier, only one shop remaining in the food court. When I was here last (Jan. 2008), I should have made a detailed listing of stores; some have definately closed since then; Bath and Body Works for example. I think you mean “Dawn Of The Dead” which was filmed at a mall (which is my most favorite mall) which opened up in the same year! Isn’t that what has killed every mall in America??? I am excited since reading in the Suburban Press that the mall sale is complete. Cannot wait to see any action taking place at the Woodville Mall. Definitely will be nice for all us die-hard eastsiders who hate having to go anywhere toward Franklin Mall area. I just got home from the mall and was excited to see that they are starting to rip up that old, crappy green-ish carpet! Maybe they are finally renovating it! We need a good mall on this side of town and I think it would be a great investment, if someone manages it correctly. Can anyone tell me who the current mall owners are? I grew up living directly next to Woodville Mall; I have a lot of good childhood memories there. One that will always stick out in my mind, however, are the massive Christmas displays and boat shows that the mall would host each year. Though now these displays might seem miniscule in comparison to modern exhibitions, as a child, the displays seemed so grandiose. I still have a feeling of awe when I remember what it looked like in there around Christmas time as a kindergartener. As sad as it makes me that the mall is surely not going to recover from it’s decline, my memories will keep it preserved as a place of excitement and childhood bliss. Wow! How sad. I remember going to the Woodville mall at Christmas when I was a little girl…that was back in the early ’70’s and the mall was always packed. Christmas music playing…it was magic land. Of course I was very little and excited. Hopefully some clever industrialist can figure something out before they close the whole thing up! Woodville Mall never had a Macy’s. It was LaSalles I believe you are thinking of. Sear’s, LaSalles, and JC Penney were the three anchor stores. @Carol, I believe LaSalles’s became Macy’s in the 1980s. Not the Macy’s that we know now. The Macy’s stores in Toledo in the 1980s were sold and I believe re-branded as Elder Beerman. I could be mistaken, but I think that’s right. More recently, Macy’s took over Marshall Field which of course had absorbed Hudsons earlier. @James, @Carol. It was was Macy’s before the store closed. The changeover occurred in 1981. The mall now is so dead! They have to give it a makeover or atleast a NEW OWNER!! And all people do there is just jog around the mall they dont buy anything. Me and jerks went there all we saw was tumble weeds rollin by (metiforacally)! I cant take that mall all people go to is the andersons! the only good store there is debs. where i get my hats and sunglasses. No offence to the owner but it stinks and no one will go there until good stores are there. When i first moved to this town there was claires, bath and body works. those were the top selling stores there. and now their gone.so basically the mall is doomed. and there is too many leaks and stains! AGHHHH!!!! Get a new owner and give us people the mall we DESERVE!!!!! Shes right even tho i hate her. shes right. ive lived here all my life. and its just going down and down.i want a mall i can bring new girls to and not be embarrassed. cuz the only reason my skool’s student population has gone down because of low popularity and theres no good stores i wish for a new mall soon. I was there a few months ago for a movie, so the FOX is still alive and showing movies. It was late so the rest of the mall was gated off (or maybe always closed?) so I didn’t get to take a look around. As per the above, it seems that just about all the last of everything is gone now. They finally leveled Southwyck, so it’ll be interesting to see how much longer Woodville has. It’s sad that with all the various talk and owners in recent years it still seems like nobody has managed much of anything. I live out by Franklin Park now, sorry, Westfield Shopping Center, and I HATE IT! I’d actually probably drive out to Woodville to avoid the traffic and snobbs out here – if only there were something there to drive to. Well as of today. there are changes coming to the Woodville mall. There is a new marketing director and she is very energetic about bringing the mall back to life. its not going to happen over night but we are working on some great plans and you will definitely see some positive changes. First step for me is getting Santa and invite the kids out for photos with Santa. There will also be a Christmas bazaar for you shopping needs. (I am not involved in that). But as I gather from meeting with her today. She definitely has a great passion to bring this mall back to the great mall it was. I see good things and positive growth coming. and other yummys along with some locally crafted hand made items. e, as well as lifelong area resident- I cannot even begin to express my frustration and disgust over the current state of affairs at Woodville Mall. Apathetic does not even begin to describe it…but who do we blame? And “why” haven’t we begun to make our voice heard at a more prominant level? There is great room for opportunity and growth at Woodville, especially with nearby Maumee Bay State Park and Lake Erie Island tourists. This could be a destination location!! I currently work at Westfield Franklin Park and am considering changing job positions due to the high crime rate and gangs. It is UNSAFE here, yet mall management largely ignores the changing clientele and ‘sweeps it under the rug’. We have had car break ins, assault and battery, attempted kidnapping, public indecency, solicitation, sexual assault, etc. Are these issues that have ever regularly been an issue at Woodville Mall in the past? NO!! Woodville has always been an ideal family shopping venue. I would like to suggest extending the mall wings from Sears “to” the Sears Auto shop and north to Rte 579, as well as extending the northern wing and cross section by the former Elder Beerman entrance. A pedestrian footbridge and covered/climate controlled walkway to the former Steve & Barry’s would be nice, as would a completely renovated and fully landscaped parking lot. I would like to see stores such as Trader Joes, Urban Outfitters, H&M, Hot Topic, GAP, Wet Seal, Anthropologie, Borders, Starbucks, Orange Julius, Jamba Juice, Panera Bread, Au Bon Pain, Potbellys, and Body Shop. A Great Lakes themed inspired architectural design scheme with intensive water features and natural lighting/skylights would be great to see as well!! Now let’s let our opinions be heard more prominantly via our local newspapers, as well as contacting Northwood City Council, Toledo City Council, etc. Otherwise this property will continue to sit in a state of pathetic disrepair. @Chad, Ido like that idea very much lets hope one day it happens. Is the mall currently open? Not only is Woodville open as I found out yesterday, but a few new stores are popping up. No chains, just independents, but a small sign of life. Thats great to hear! I will be visiting soon! i was in the mall a few weeks ago and could not believe the changes i saw. we need a mall that is good and clean in the area besides westfield mall.in the winter time i hate fallen timbers since you have to go out from store to store. I worked at the Santa photos at Woodville in 2002. The construction of the new I-280 bridge slowed down business in this area for a couple years. 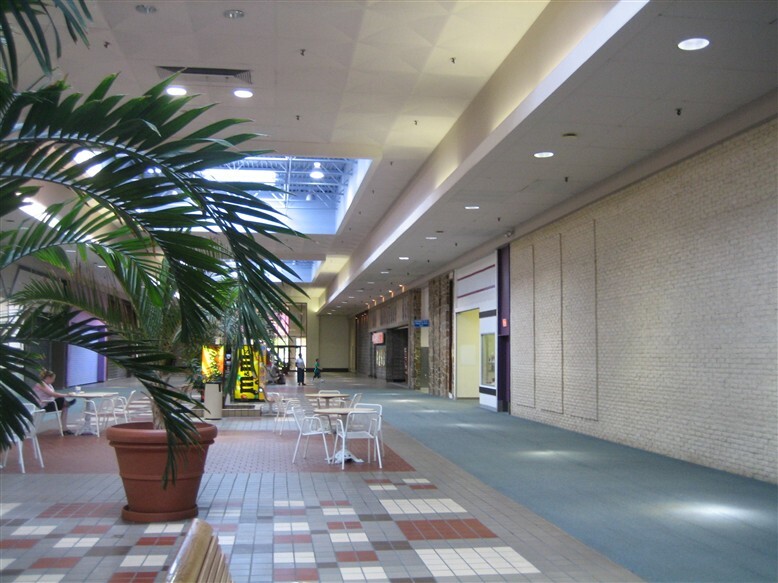 The mall always had that snagged running carpet on the main paths, and at the time I was there business was good, not as good as earlier years considering there were a number of shuttered businesses, including one I operated out of. The food court was a great place. They had a greek diner on the corner that offered good food plus discounts to mall employees. They had a A&W rootbeer, which was rare, considering the nearest one was up in Monroe, Michigan. There was an indoor skate park on one of the businesses, and a lifestyles outside of the bustling Andersons market. Fox Theater was pretty old school, but very unique because they often had new movies on their venue that no other theater was running. I remember driving from wets toledo to woodville to see “The Transporter.” They had a so so arcade across the way, and at the time i worked there, they had a vintage toy store that sold many hard to find thinsg like Star Wars. Was a quiet and friendly mall. 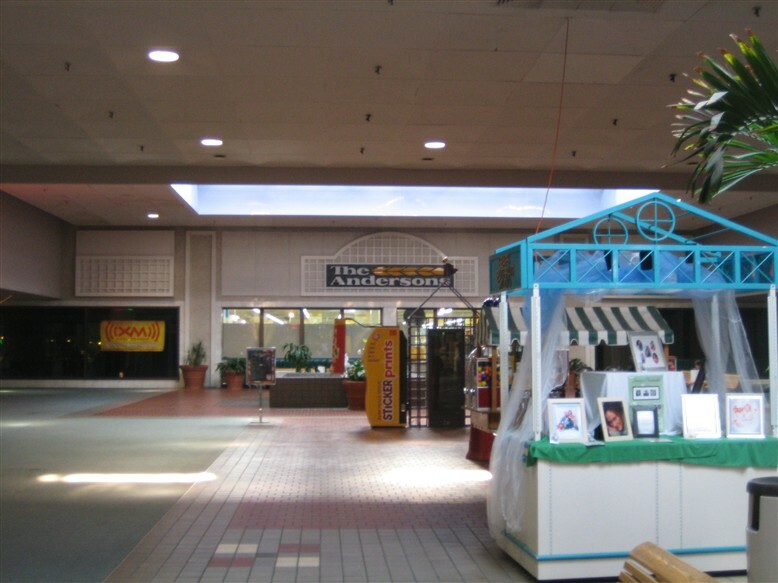 I was in the Woodville Mall on 5/15/2011 and it looks horrendous. The carpet is gone, now the old floor stained brown from the glue is ringing the walks. The theater was open and actually showing Thor plus two other films. Problem was the only had one movie poster. The other two simply had the show name and times on paper printed off of a computer. The only real clothing store was DEB, everything else was some type of half outlet/half thrift store. With the closing of Elder Berman then entire end of the mall is empty. So many of the ceiling tiles are brown from water damage. I was shocked that the fountains were still going and clean. Although the sounds of the fountains were the only thing breaking up the silence of the place. The back parking lots, between Elder Berman (RIP) and Sears look more like fields than a parking lot being so overgrown with weeds. 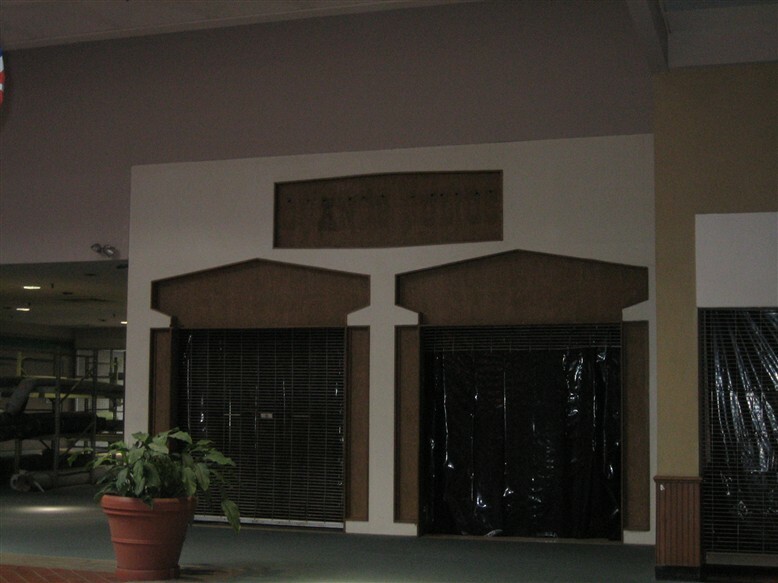 The most depressing part of the trip was the empty storefront that help the “Memories of the Woodville Mall”. The poster board the photos were hanging on were falling down and wrecked. I was shocked by the amount of people that were actually in the mall, mostly older mall-walkers and people who had mistakenly wandered out of The Andersons. I had so many memories of the Woodville Mall and it was my first time in there in ten years. I really wish I hadn’t gone back, the state that the mall is in is totally depressing. I’d rather remember it as the boat shows and trick or treating. Wow – can it get any worse?? Woodville Mall is going to close. Whereas in June 2011, there were 25 tenants with more to come, the count is back to 12, and city officials want to close it because it’s unsafe. There’s no heating, the roof is leaking (and possibly in danger of partial collapse), the sprinkler system doesn’t work, lots of mildew, water damage, and buckling floors. They say the owner could fix the damage, but don’t count on it. @Pseudo3D, I’m surprised it didn’t die years ago. it’s been limping along forever. What ever staying power it has probably speaks to Sears and The Andersons. I read on Facebook that Freakin’ Yummy Desserts (advertised here in a Dec/10 comment) had moved out in June of this year. Fox Theater closed on the 13th. Glad I snagged the last four movies: Arthur Christmas, Happy Feet Two, Jack and Jill, and Breaking Dawn Part 1. The mall has closed (except for Sears and The Andersons) “temporarily” (two weeks) until a hearing on December 28th to see if it should reopen or remain closed. 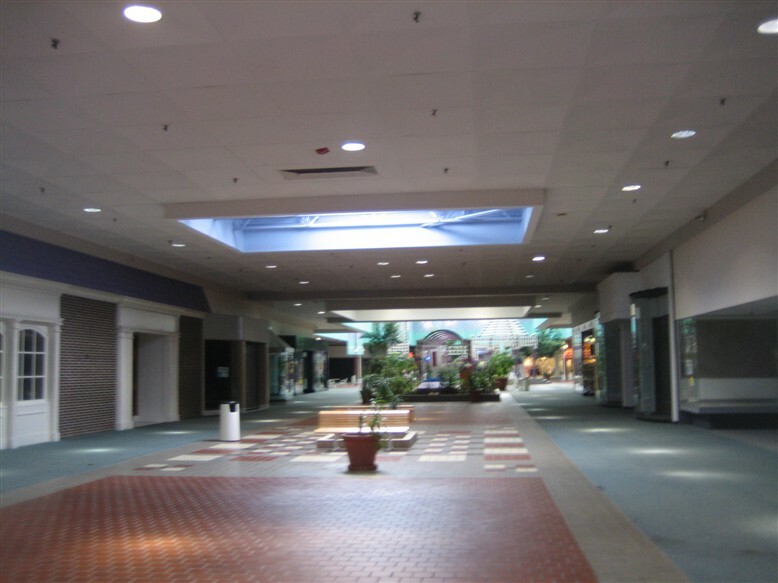 However, the owner does not have the resources to fix the mall, meaning that basically the mall is totally dead. Great run, Woodville Mall. I’m sorry you died. Hmmm, so an emergency trip to Toledo this particular weekend probably won’t be a good idea (although I WAS considering it until I saw your new post). I’d like to see the mall one final time but I’d bet its not gonna re-open. Stick a fork in it, its done. Sad. @Charles, don’t bother.. Sad to say, the mall is officially closed.. I spent the better part of the day on Wednesday December 14th at Woodville Mall taking pictures, just two days after the mall was inspected by the Wood County Health Department and deemed a public health hazard. Merely two days later on the night of Friday the 16th at around 7 PM, my husband, our kids, and I ventured into the mall on the hunt for a Christmas dress for our youngest daughter’s school Christmas program that’s scheduled to take place this coming Monday. Upon our arrival we noted that every news station in the local area was there with cameras set up at the mall’s main entrance, and the Northwood Police Department pretty much had the place surrounded. We parked the car and watched as people entered the mall through the entrance closest to The Andersons. We also saw a few mall shoppers coming out of the same entrance with Deb’s bags in hand, so we assumed it safe to follow through with our original plan. Not sure what to expect when we entered, we treadled lightly. We were approached by a friendly police officer as we were getting ready to step foot into the Deb store. He asked us a couple of questions and proceeded to tell us that we had to leave because they were there to close the mall down as per a court order. About that time, the manager of the Deb store came out and began closing the gate. I told the officer that I was sad to learn of the malls demise since I have many good memories of the mall dating all the way back to the late 70’s (thanks to pictures) and 80’s. The officer asked me what we were in the mall shopping for. I explained that I was hoping to get my daughter a dress for her Christmas program at school. He walked over to the gate, motioned for the manager, and asked her to open the store for us. He then granted us permission to go ahead and enter but warned that we wouldn’t have much time. In the end we wound up with two dresses, two pairs of shoes, a bundle of socks, and a necklace that came with matching earrings. We were the last paying customers to step foot out of the Woodville mall before it was shuttered and closed down forever. The manager of the Deb store followed us out and locked the gate for the last time behind us. We noted as we were leaving that there were signs hanging on the mall entrance that must have been hung while we were shopping, as they weren’t there when we arrived. The one simply says “MALL CLOSED” ~ The other two are signed and stamped copies of the court order written up by clerk of court stating that the building is to be locked down. The remaining tenants have 14 days to remove their belongings and vacate the premises. The damage done by the leaking (and partially collapsed roof in spots) is unrepairable. The owner of the mall has made it known that he doesn’t have the financial means to fix it even if he could. The likelihood of the mall every reopening to the public is pretty much zero. Rest in peace Woodville Mall.. Thanks for the 42 awesome years (35 1/2 for me) that you served our community. You will be missed but never forgotten. If you wish to view the pictures I took on Wednesday, here’s a link.. I hope that I’m doing this correctly and that you’re able to access them here..
I’ve seen a few mistakes here and wanted to correct them for posterity. First of all, Woodville Mall was a big deal when it opened in 1969. 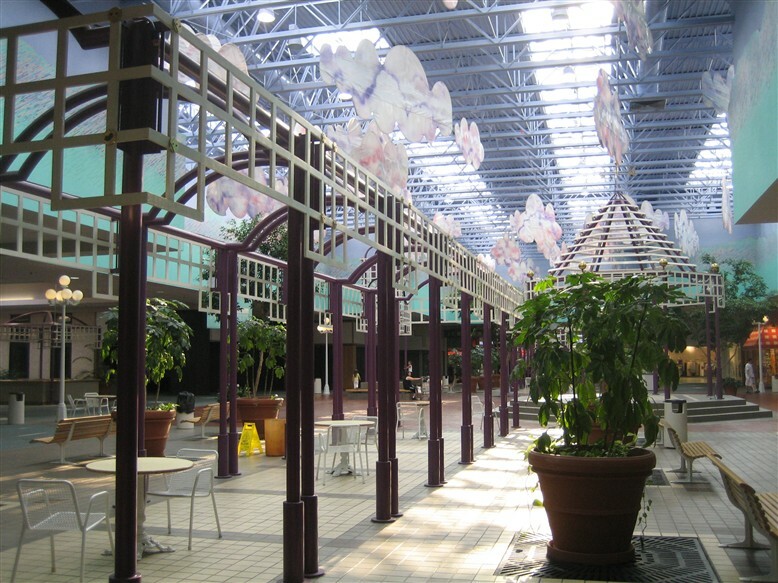 It was Toledo’s first enclosed shopping mall! Before that, the only competition shopping centers were Westgate, Parkway Plaza, and Great Eastern (all outdoor shopping centers). Woodville Mall held that distinction for two years, until the Franklin Park Mall opened in 1971. Franklin Park had as anchor stores a Penny’s, a Lamson’s, and a Hudson’s. Lasalle’s (not spelled as some people have spelled it) was a venerable Toledo institution dating from the 1800s. Lasalle & Koch Co. (the official name of the company) built its landmark store downtown in 1918 and operated there until the R.H. Macy management closed it in 1984. Lasalle and Koch Co. was purchased in 1923 by R.H. Macy of New York. Although almost every item sold by Lasalle’s had a Lasalle’s label (“Made Expressly for Lasalle’s, a division of R.H. Macy and Co.”), occasionally merchandise would show up with the Macy’s label, especially in the 1970s. Macy’s was going through some hard times during these years, and was not the Macy’s of today, which is really Federated Department Stores (a big competitor of Macy’s from the old days) using the Macy’s name. 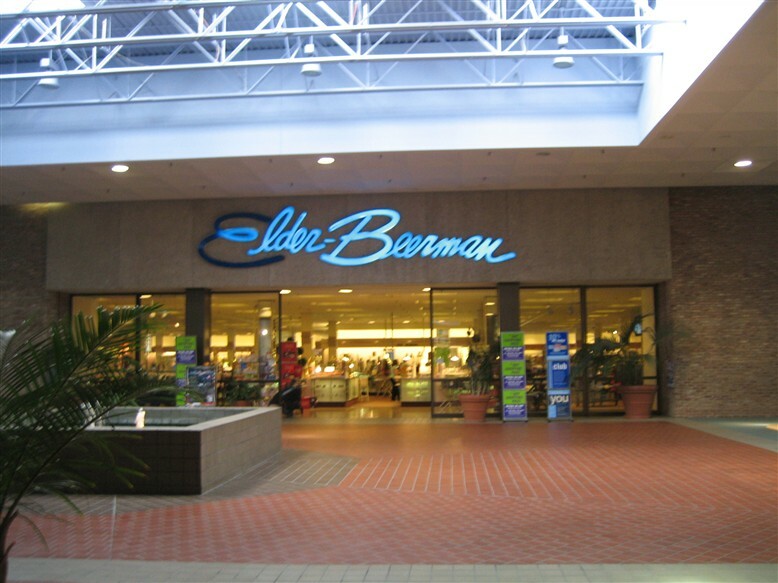 They chose to sell the Toledo and other northwest Ohio stores to Elder Beerman in 1985. So the store we knew and loved as Lasalle’s was only briefly Macy’s (about two years) and then Elder Beerman until the store closed. The condition of retail today is nothing compared to what it was back in the heyday of Toledo, when people would go downtown to shop at Lasalle’s, The Lion Store, Lamson’s, and Tiedke’s, and perhaps linger for dinner, see a movie at the Paramount, Princess, Rivoli, or Valentine. All of those stores had their own personalities, and employees who worked there for years and knew their customers. They are starting to put a fence around the mall to tear it down..it will be a sad day to see it gone. I grew up going to Southwyck Mall and now I live over past the Woodville Mall. Hopefully something will go up instead of a vacant lot. Mall is mostly demolished by now, one year after your post. The closed Anderson’s and Alder-Beerman stores are about all that’s still standing.